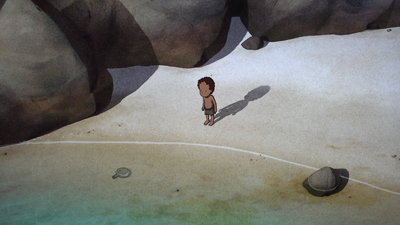 A shipwrecked man makes it to an apparently deserted island, where his first instinct is to fight nature, before realizing that he is a part of it. Imagine that you are a Dutch, award-winning animated short film and commercials director, who has no prospects or even plans to direct a feature. Then, Toshio Suzuki and Isao Takahata from Studio Ghibli in Japan write you, and say that they would like you to direct a Ghibli film, with all the production work to be done in Europe, to be overseen by Wild Bunch. That seems awfully unlikely, right? 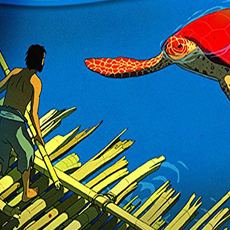 And yet, so begins the genesis of The Red Turtle, a film that went on to be nominated for a Best Animated Feature Academy Award, and won major prizes at Cannes, in the Annies, and numerous film critic awards. Being based in London, director Michaël Dudok de Wit could not have been expecting to be receiving a letter from Japan about a project, but that did not stop him from expressing interest immediately. 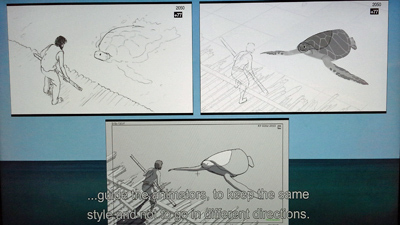 Some people at Studio Ghibli had briefly met Dudok de Wit before, and were very impressed with his Oscar-winning short film Father And Daughter, and thought that he shared a certain sensibility with Studio Ghibli. They proposed an arrangement unique for the studio: they would produce the film, and provide creative support, but Dudok de Wit would retain full control over the Europe-based production. Famed director Isao Takahata would give some of the most helpful advice during the course of the creative process, though he encouraged Dudok de Wit to be brave and trust his instincts. 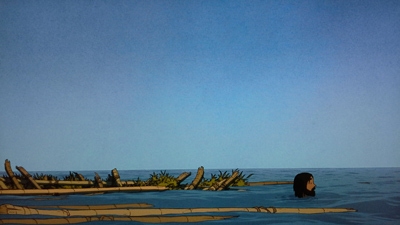 Dudok de Wit had a slim idea of a story that he thought could be expanded into a feature. 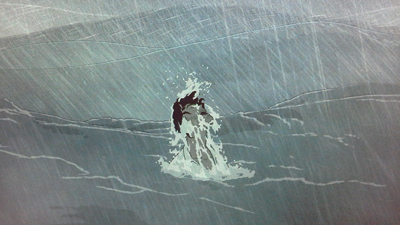 Over time, it evolved into the tale of a man who, as the film opens, is adrift in a tumultuous sea. 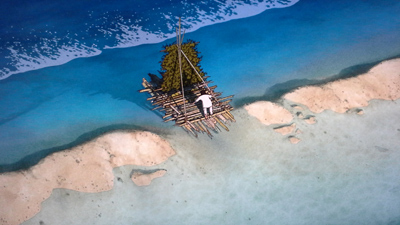 He finally finds himself on a desert island, devoid of human company. He must find ways to survive, cut off from any form of civilization. He is clever, though, and sure in his feeling that his intelligence shall allow him the opportunity to succeed in leaving the island. 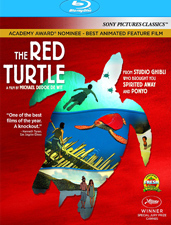 In his struggle to escape his island prison, he comes up against a giant red turtle, who continuously wrecks his escape raft. The man becomes violent in his frustration, angry that nature has chosen to oppose him so wilfully. He is shocked by his own rage, however, and comes to regret it. His stance on his new life changes further when he is joined by a mysterious woman. 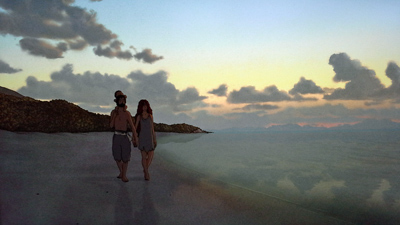 She initially keeps her distance, but eventually they become intimate, and live out their life together on the island. This life includes many challenges, whether it be for food, reliable shelter, or protection from severe weather. Gradually, the man accepts his new home, and realizes that nature is not a thing to be fought, since we are all a part of it, and therefore such a stance means opposing oneself. Moreover, he must learn that happiness can be found even when life takes you to unexpected places. The destination is not always what you thought it would be, and the journey there is unpredictable. Ultimately, it is a personal choice to make the best of one’s circumstances, to choose to be happy. This simple tale could have possibly been told effectively in a seven-minute short, but that would be insufficient to have the audience fully enter this man’s world. The film is devoid of dialogue, and so the audience instead enters into a more visceral experience of the man’s challenges and frustrations, and ultimately his happiness and contentment. 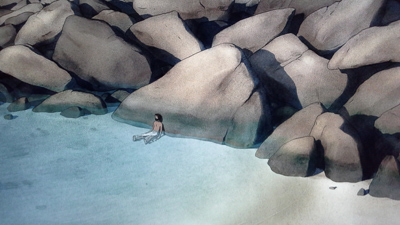 The lush animation, produced in France and Belgium, lives up to the term—this world is simple, but extremely alive. The bamboo trees, the birds, and the sea all move continuously, bringing the world of the island to vivid, beautiful life. 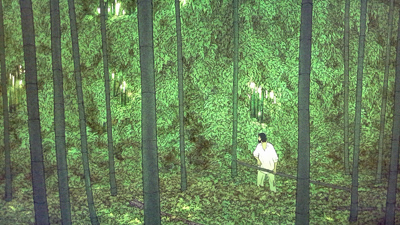 The film serves as a fable, with some fantastic and unexplained elements, becoming almost dreamlike. The man is never identified by nationality, and only rarely do we hear anything more from him than a grunt or scream. He is an everyman, he is us— on a life journey that takes him to unexpected places both physically and in his soul. By the end of the film, the audience may feel that it has travelled alongside him, and reached a new level of enlightenment. The simplicity of the tale, and the way in which it is presented, allows for multiple experiences among those who view it. Some may think it boring, some may think it bizarre, but others may find it stunningly profound. For me, the depth of the experience grew in the days that followed my viewing of it. It is a story that stays with you, and sinks in over time. And I think it was lovely. 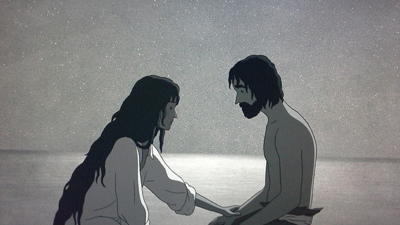 The Commentary with Michaël Dudok de Wit thoroughly explains the story and themes behind the film. This material is further enhanced by a number of great featurettes. 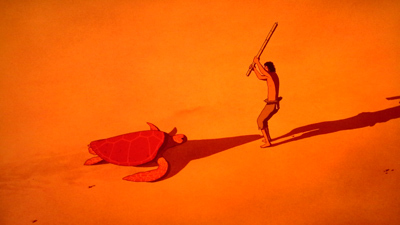 The Birth Of The Red Turtle (56:36) discusses the genesis of the art of the film, with Dudok de Wit describing all of his various choices concerning the film’s style and numerous artistic choices. It is a nearly hour-long lecture by a true artist, letting us in on his creative process. During the discussion, we see plenty of art and various stages of animation. This feature and the next are spoken in French, with subtitles available. 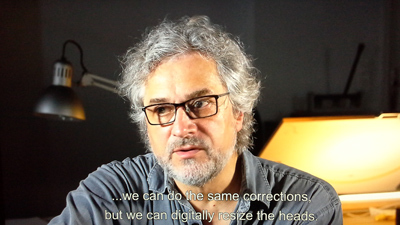 The Secrets Of The Red Turtle (17:45) allows us to sit further with Dudok de Wit, as he demonstrates his art, with pencil in hand. 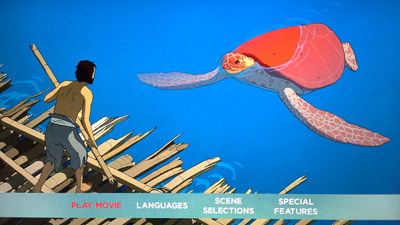 The Red Turtle At AFI Fest Q&A (20:47) is yet another wonderful talk by the director. He discusses how the film came to be, and— in case you still are not sure of the film’s intent— he lays out the themes he was striving to convey. The disc begins with trailers for the live action international films Our Little Sister, The Eagle Huntress, and Dark Horse. 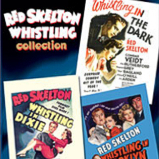 Sony has packaged the film in a standard Blu-ray case, with a single disc. There is also an identical cover slip, and no inserts. You cannot ask for more out of a film transfer. The film looks terrific, as one would expect from what is almost certainly a digital-to-digital effort. 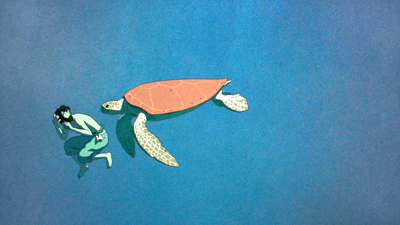 This film was mostly drawn on a graphics tablet, though the turtle was done via CGI, and so all the work exists in the digital realm. The rich colors and amazing beauty of the film is more than evident on the Blu-ray, and if one sees any occasional slight jaggedness or shimmering, one has to wonder if it was perhaps endemic to the original production process. The characters may not speak, but as the saying goes, the film is far from silent. The sounds of the sea and the island are always in evidence, and the 5.1 DTS-HD Master Audio track places you right in the middle of it. Oftentimes, it is the subtle sound of the wind or ocean, or skittering crabs (who amusingly struck me as a type of silent Greek chorus), but when a tsunami bursts forth, one certainly gets the full effect of swirling wind and water. The audio track is labelled as being “English”, but that’s a misnomer, since no real language is spoken. That didn’t stop Sony from providing subtitles, however. About the only word spoken is “Hey!”, or in Portuguese, “Ei!” The other choice is Spanish (“Hola!”). The only subs that have use are the English Subtitles for the Deaf and Hard-of-hearing, for those that require it. Though it did not win the Oscar (nothing was going to stop Disney’s hit Zootopia), this is a winning film for the art house crowd. Attractive visuals, a simple but arresting story, and a deep message make this a must-see for more demanding fans of film and animation. Such a film can be easy to dismiss by those looking for more obvious thrills, but the ample special features on the disc will help place the film in perfect context for those who initially found the film too weird or simplistic. Given the opportunity, this film can win you over, and it might be even better the second or third time. I hope that Studio Ghibli found enough success in this to encourage them to partner with other strong international directors. The result of further such collaborations could prove just as rewarding.